Hello everyone, guess what we have today for you all? Well it is about spooky, horrific and dreamy day when we all be dressed up in awful attires, it will be that period of the year when the world will envelop itself in a dark veil, we will get to see a lot of surprises in terms of Halloween gift baskets, settings, accessories, makeups, decorations and costumes and hence the day will be summed up having memories & snaps that we will watch throughout the year till the event comes again. Malls and markets offer a lot of Halloween stuff to help people with their decorations and costumes. As far as pumpkins are concerned, you must get yourself a tool kit to carve pumpkins for Halloween day, the carving kit includes scraper, saw, scoop, pounce and drill, craft knife, tape and cutters etc. they are available in drugstores and party supplies’ stores around Halloween time. With the right tool kit and technique, the job of carving becomes a lot simpler and yet so easier. For tracing the template or a stencil over the face of a pumpkin, a marking wheel is essential. Also you may add a blinking light or place a candle inside the carved pumpkin for it to look more dramatic. Down here you will see how to carve a pumpkin for Halloween, these are 3 DIY simple video examples for kids & adults. Yes, you read it right, they are super simple that even kids can follow the technique without taking any help of an adult. Besides, adults can add more creative energy into their carvings to make a best face out of the pumpkin. Also while choosing the right size of the pumpkin, do check that the outer skin is not scratched or injured. The rest of the detail is simplified in the videos. So without taking much of the time, scroll down to the videos and start making your own halloween pumpkins yourself. I wish you all have a festive time where there’s no sorrow and no regrets, but only happiness and joys. Boo! Watch out for scarring on pumpkin mostly damaged from inside also dark pale and yellowish color pumpkins are rotten from outside and inside , find even textured pumpkin as well as dark orange color as well as golden brown brown are perfectly fine. Clean it up from inside by using a pumpkin tool kit (buy the best 13 pieces tool kit) watch the video for self help. Do not forget to scrape and smooth the inner part later on it will be easy to carve. We highly recommended you a professional tool kit we have mentioned above it is cheap and made of stainless steel. Now time to download from the list of 250+ pumpkin carving stencils, choose the one you like, download the pdf file, print the pumpkin stencil on a sheet of paper by using any plastic tape and paste it on your pumpkin face shown in the video below, use the marking drill wheel tool from the tool kit to mark lines and take the paper off. Use pumpkin knife to cut the pumpkin face then cut off the edges and any imperfections, it will allow light to come out more and shine throughout pumpkin. 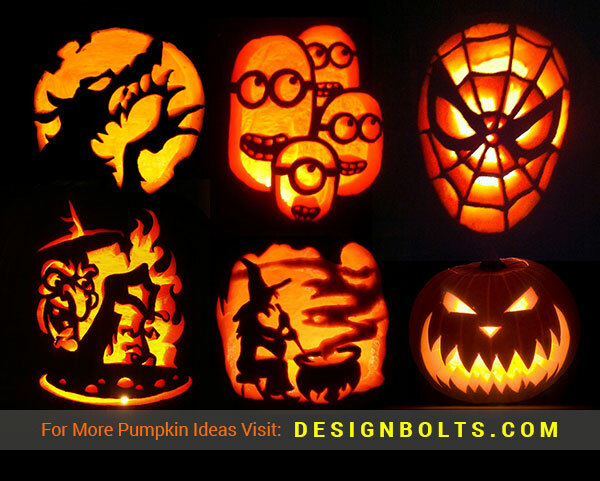 Check out the awesome final result, now you have learnt how to carve a pumpkin for halloween above all Happy halloween from designbolts. 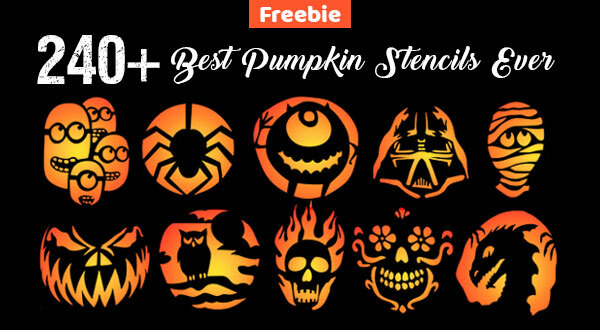 Check out some of our comprehensive list for halloween 2018 including halloween pumpkin carving patterns, pumpkin carving stencils, pumpkin carving ideas, wallpapers, facebook covers, party halloween outdoor decorations, halloween masks, halloween fonts, halloween drawing stencils etc.